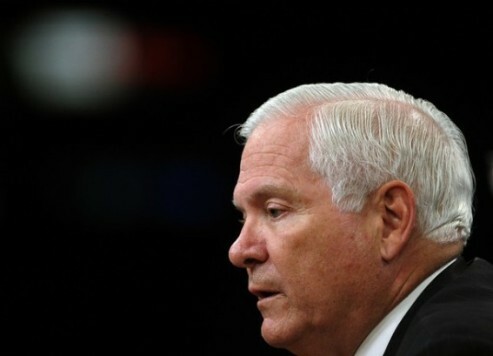 WASHINGTON, Dec. 27 (KATAKAMI / Yonhap) — U.S. Defense Secretary Robert Gates will visit South Korea next month to discuss enhancing the alliance with South Korea, the Pentagon said Monday. The chief U.S. defense official will also travel to Beijing and Tokyo, Morrell said. The visit comes amid rising tensions on the Korean Peninsula after North Korea’s shelling of a South Korean island last month that killed four people in the first attack on South Korean soil targeting civilians since the end of the 1950-1953 Korean War. North Korea had backed away from its earlier threat to retaliate to a series of military drills South Korea conducted independently and jointly with the U.S. in recent weeks in a show of force against further provocations. The South Korean military, however, still remains on high alert. New Mexico Gov. Bill Richardson, who traveled to Pyongyang earlier this month to help ease tensions, meanwhile, had briefed the State Department on his trip to North Korea, the department said. Deputy spokesman Mark Toner, however, dismissed Richardson’s trip as a private mission. Richardson, former U.S. ambassador to the United Nations in New York, returned from a week-long trip to North Korea last week amid rising tensions after North Korea’s shelling of Yeonpyeong Island and a series of military drills by South Korea in a show of force against further provocations. The North has proposed a series of rapprochement measures to the troubleshooter. Among them are the return of International Atomic Energy Agency (IAEA) inspectors, negotiations for the sale of 12,000 spent nuclear fuel rods and the establishment of a military commission consisting of representatives from the two Koreas and the U.S., and an inter-Korean military hotline to prevent conflicts in the disputed western sea border. North Korea expelled IAEA monitors early last year in the wake of U.N. Security Council sanctions for a rocket launch seen as a long-range missile test. Months later, Pyongyang detonated its second nuclear device after one in 2006, drawing harsher U.N. sanctions. Reports said Seoul and Washington have been discussing ways to revive the six-party talks on North Korea’s denuclearization, which have been deadlocked over last month’s shelling and the sinking of a South Korean warship in March. The return of the international nuclear monitors is one of the preconditions Seoul and its allies have set for the reopening of the nuclear talks, involving the two Koreas, the U.S., China, Japan and Russia. Washington will continue to consult Beijing, North Korea’s biggest benefactor, to resolve issues related to North Korea, he said. Richardson told CNN last week that now is the time for the U.S. to re-engage North Korea if Pyongyang refrains from reacting militarily to South Korea’s military drills. Seoul and Washington have dismissed the gestures as part of the North’s traditional brinkmanship, urging Pyongyang instead to apologize for shelling Yeonpyeong and sinking the Cheonan before returning to the six-party nuclear talks. South Korea and the U.S. also want the North first to take concrete steps toward denuclearization. China and Russia want the nuclear talks to reopen as soon as possible unconditionally. North Korea last month revealed a uranium enrichment plant that it claims is producing fuel for power generation. Concerns persist that the facility could produce highly enriched uranium for nuclear weapons. December 05, 2010. 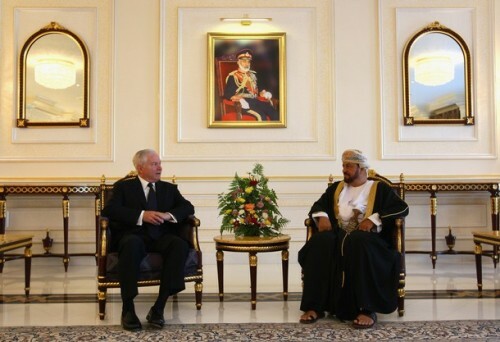 MUSCAT (KATAKAMI / CharlotteObserver.Com) — Oman Tensions with Iran and the escalating terror threat in Yemen will be key topics of discussion when U.S. Defense Secretary Robert Gates meets Sunday with leaders in Oman here on the edge of the Arabian Sea. An ally of both the United States and Iran, Oman has served as an intermediary in negotiations with Tehran, including successful mediation in October that led to the release of an American hiker held in an Iranian prison for more than a year. Gates’ visit comes against the backdrop of the recent WikiLeaks release of some quarter million sensitive and classified diplomatic memos – or cables in diplomatic parlance. Many underscore the Arab world’s anxiety about Iran and its nuclear ambitions. The cables detailed pleas from Arab leaders for action against Tehran, making public a broad sentiment that the largely Sunni Arab world generally only discusses in private about Shiite Iran. One of the stronger comments came from Saudi Arabia’s King Abdullah urging a U.S.-led attack against Iran to “cut off the head of the snake” and cripple its nuclear weapons program. Leaders across the Middle East fear that Iran’s development of nuclear power will trigger a deadly nuclear arms race in the region. The U.S. and others, however, have employed a two track strategy with Iran, that is one part diplomacy and one part increased sanctions aimed at crippling Tehran’s economy. 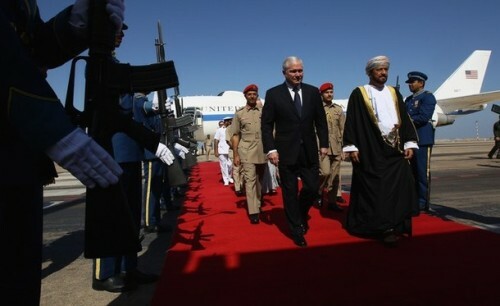 A senior U.S. official traveling with Gates said that Oman’s Sultan Qaboos bin Said al-Said can communicate with Iran, and that productive relationship is valuable to the U.S.
Tehran, meanwhile, claimed another advance in its nuclear activities, saying Sunday that for the first time Iran had mined its own uranium, which can be processed into material used to make nuclear energy or nuclear weapons. The advance would give Iran a way to bypass U.N. sanctions. Iran is under four sets of U.N. Security Council sanctions that forbid the supply of nuclear materials to Tehran. Also worrisome is Oman’s neighbor to the west – Yemen, where al-Qaida in the Arabian Peninsula has been gaining strength and plotting attacks against the U.S. and other Western interests. Officials have been trying to rally a more regional effort to help the poverty-stricken Yemen battle extremists within it borders while bolstering its economic and political stability. 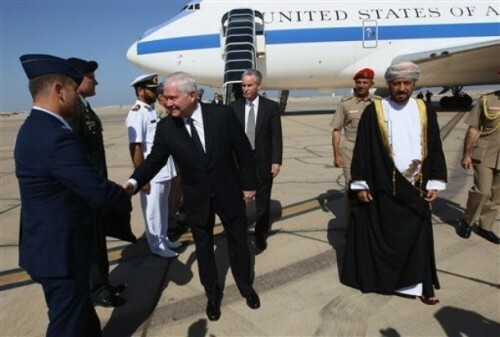 Senior defense officials traveling with Gates said the secretary’s trip is largely a courtesy call and a stopping-off point for a planned visit to the aircraft carrier USS Abraham Lincoln, which is in the Arabian Sea between Oman and Pakistan. Pentagon spokesman Geoff Morrell said this will be Gates first visit to an aircraft carrier since he took the Defense Department post four years ago. The carrier is involved in operations in Afghanistan, regularly launching fighters to the battlefront to support the troops on the ground. The WikiLeaks document release has set off a global uproar, with its public airing of diplomatic cables laying out blunt and critical assessments of world leaders and nations. Gates meetings may well touch on the often embarrassing revelations, and concerns about America’s inability to keep such sensitive reports private.